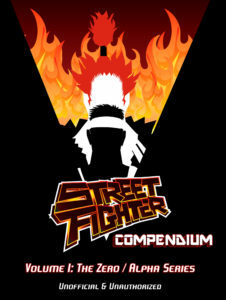 I’ve uploaded a brief flipthrough video showing what you can expect if when you buy Street Fighter Compendium: Volume I! The 88-page book is now available both digitally and in physical form! Take a peek – the book looks great!!! Just a brief peek at the enormous collection, today I’ve offered up four sample pages from Volume I of Street Fighter Compendium! Here you can get an idea of the goal of this book. 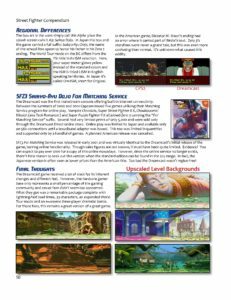 This brief taste of the final product shows off some miscellaneous Zero 2 releases and the second page of the Dreamcast’s Zero 3 coverage. Yes, there are two pages devoted to just the DC! 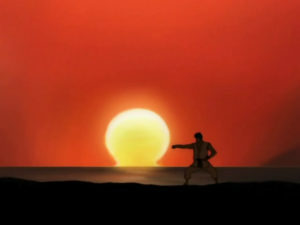 In addition the first animated film’s entry is included and 1 of the book’s 17 appendix pages – here with biographies from all the fighters, each with a relevant sprite, their game appearances and storylines. There is so much more included, these samples hardly scratch the surface. Looking forward to the book’s release in just a few short weeks! Until then, enjoy these samples! Proof Book On Its Way! I’ll have some images and info soon! However, the web site is now up and running and the first entry into the Street Fighter Compendium will out before the year’s end! Expect full details on all four major Street Fighter Zero/Alpha games – which of course includes my favorite SF ever – Zero 2 Alpha! In addition to the main games, you’ll find coverage of all the collected editions, the two anime releases, all related soundtracks, merchandise and even arcade hardware details. All this coupled with hundreds of screenshots, sprites and photos make Volume 1 of SFC the most comprehensive coverage of the Zero / Alpha series ever! The book – available on paperback or PDF form – will be available by December, just in time for Christmas! I’ll get my hands on the book shortly and may even do a quick flip-through. More details, images and info soon! Until then, enjoy a shot of Ryu training before a beautiful sunset! An avid Street Fighter fan since the late ’80s, Trevor Esposito has been running the art-focused SF Galleries, since 2003. This is his second book.